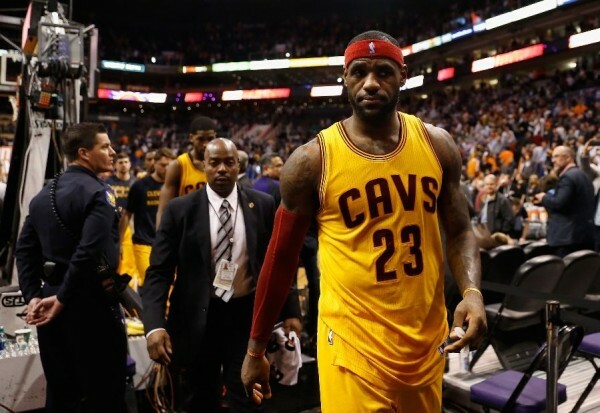 The return of LeBron James couldn’t stop the Cleveland Cavaliers from losing a sixth straight game, this time 107-100 to the Phoenix Suns, although his shoving of head coach David Blatt in order to prevent him from getting a technical foul is the most memorable moment from the game. In the first half James was called for an offensive foul after fighting underneath the basket with Markieff Morris. The call was made by the referee with the worst view of the incident, which made James go and argue things while Blatt seemed livid about the decision as well. Blatt was getting warned but didn’t let up, so James pushed him away from the vicinity, later stating that he did it in order to protect his head coach from getting T’d up. Maybe this is all symbolic. If the media had its way, Blatt would have been fired yet. Not because they hate him or anything, but simply because chaos and failure make great news. The rumors about James not being happy with his current coach might be true, and this pushing could be interpreted in the wrong way by those who have to benefit from it. There’s no doubt that James returning from his injury leaves very little wiggle room for Blatt, as his team has now lost nine of their last ten games. James was great in this game with 33 points, 7 rebounds and 5 assists. The problem was what happened when he wasn’t playing. The Cavaliers at the moment don’t look like a team. There’s James playing well, which also helped J.R. Smith put on a show with 29 points including 8-of-14 from beyond the arc, but the defense was easy to break down while Kyrie Irving and Kevin Love both settled for nine points each. It never felt like a cohesive effort out there against a very good Suns team, but simply two players doing it on their own, in charge of the huge come back run late in the game after a terrible first half. Love wasn’t even on the floor when the Cavaliers made their big comeback. He was only 3-of-11 from the field, playing 27 minutes. Kyrie Irving hardly got a moment of rest, playing 44 minutes, but didn’t do much better, usually settling for tough jumpers, hitting only 4-of-14 attempts. Tristan Thompson scored 10 points off the bench, but Timofey Mozgov was completely out of sync, scoring only two points in 16 minutes. The entire Suns lineup finished with double figure scoring, as Markieff Morris led them with a career high 35 points. Goran Dragic had a strong performance with 18 points while Alex Len finished with a double double of 13 points and 10 rebounds. Maybe the Suns provide the perfect example right now for the Cavaliers – a team, and not a bunch of individuals that happen to put on the same jersey. Having LeBron James back is a huge boost, but it won’t do his team much good if Blatt doesn’t start making more out of what he has.